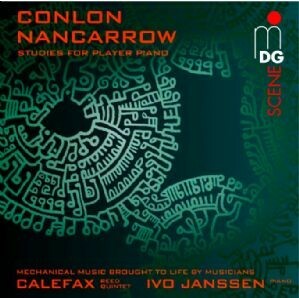 Studies for Player Piano: Conlon Nancarrow | Calefax Reed Quintet | Dispeker Artists, Inc.
Nancarrow’s wrote his Studies for player piano for the pianola, a mechanical piano. These musical experiments were meant as studies for the composer, not for musicians to actually perform. Calefax and Ivo Janssen worked 7 years to make the live-performance of some of the studies happen and recorded tham on this CD.